Politicians joined students to condemn the fees. Hundreds of students rallied at the Dining Hall this afternoon, as politicians, students and staff promised to fight to the bitter end against supplemental exam fees. If the day began with a carnival atmosphere, as students peaceably took over the Dining Hall, anger was palpable by the end of the rally, with students fired up by speech after speech that attacked Provost Patrick Prendergast and promised to start a movement that would unite staff and students across the country. As College staff and tourists looked on, student speakers promised to take Trinity to the negotiating table over supplemental exam fees. Today is the third day of action. Previous demonstrations have included blocking entry to Front Gate and the Book of Kells and protesting outside a Finance Committee meeting in House One. Supplemental exam fees, which Trinity’s Board approved in February, have become a flashpoint for students used to bemoaning cuts, fee hikes and efficiencies. After years of litigating issues at committee-level, students have turned to protests and pickets in a bid to secure national attention for the fight against fees. The demonstrations across campus are a rare show of force from students used to a College that has repeatedly turned the blame on government inertia on higher education funding. 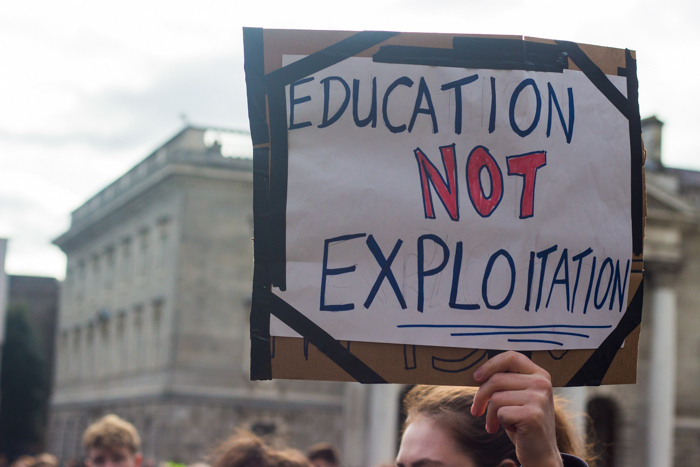 Over the last few months, Trinity’s senior staff – including Chief Financial Officer Ian Mathews and Vice-Provost Chris Morash – have appealed to students to understand their hands are tied. Yet it’s fallen on deaf ears. 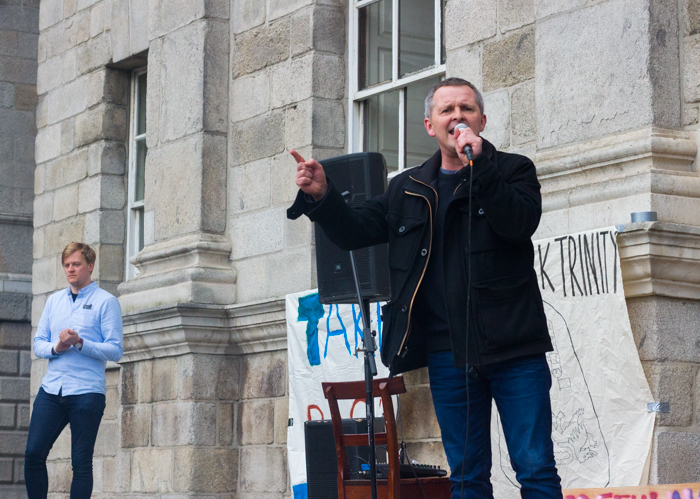 TD Richard Boyd Barrett addressing students from the Dining Hall steps. Spirits were high as students sat chatting on the Dining Hall steps, and music – including Pink Floyd’s “Another Brick in the Wall” – rang out over Front Square from a sound system set up on the platform. The occupation drew attention from passing tourists many of whom took photos and looked on with a mixture of interest and bemusement. A steady trickle of students joined the ranks over the course of proceedings. Politicians and public figures were also in attendance, including Senator David Norris, People Before Profit TD Richard Boyd Barrett and Sinn Féin senator Paul Gavan. 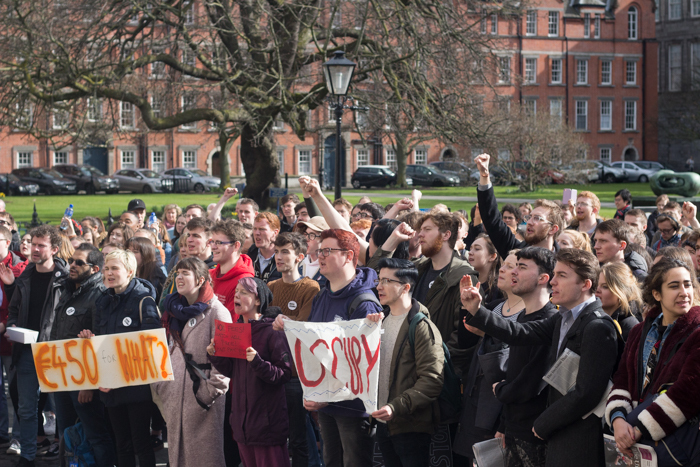 Many called on this demonstration to be the start of a movement, while other drew parallels with the struggles faced by staff in Trinity over the years. “It’s great to see that student resistance is rising. To my mind, this not just a fight against fee increases. There should be no price tag at all”, Boyd Barrett continued. “This is the greatest moment for your SU in years. Let’s stand firm, let’s stand to win and let’s teach this university a lesson”, Gavan concluded. The head of the Trinity branch of trade union Unite, Ciaran Perry, also spoke to students from the Dining Hall steps. He said the union wants “to support you in your struggle against College management”. The occupation has spilled onto the steps of the Dining Hall. Dublin City Councillor and member of the Worker’s Party Eilis Ryan was also in attendance. When speaking to the crowd of students gathered, she told them she was “shocked” to hear about College’s decision to introduce a €450 fee for sitting supplemental exams. Since 10am this morning, a group of students have been occupying the Dining Hall. With signs propped up on the steps outside, inside students milled around waiting for the bigger rally to start. On the wall at the back of the room, a large banner was hung reading “student protest against €450 exam resit fee”. Since the occupation began the Dining Hall has been effectively shut down. As the day continued, only students with “Take Back Trinity” badges were allowed to enter the building.